Note: Some of my products have some “out there” ideas. Make sure to look at the preview before purchasing. Everyone's classroom is unique and while these lessons work within my classroom, that may not be the case in another’s room. "As the sun breaks above the crowd, an old man stands on the hill." Odin (or Woden), Loki, Thor, and Valhalla are common legends that appear in the novel How to Train Your Dragon. They are not so common to some of our students and to best set students up for success, becoming familiar with these characters/location can increase reading comprehension. Enjoy! This is the Norse myth of Thor's Hammer, taken from norse-mythology.org/gods-and-creatures page and cited in the reading, with 7 sentence starters (designed for ESL students) and KEY for easy grading. The font is student friendly and there are three images for discussion and/or analysis. This is a shortened version of the Norse myth of Ragnarok from norse.mythology.org, and it includes 10 sentence starters for post-reading comprehension check. Works best after front-loading information about Norse deities (See: Intro to Mythology PowerPoint on my page). Thanks for looking! 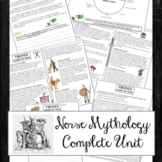 Learn and remember the stories, characters, and escapades of the Norse gods and goddesses! This fun quiz includes 14 questions with answer key included. This is a 8th grade mythology unit test using vocabulary as well as gods and monsters. This one is designed for students with special needs or low English skills. This is an 8th grade Norse myth test on gods and vocabulary. It is leveled to meet the needs of low to mid grade level for 8th grade students. This is a Norse myth test made for a 8th grade mythology unit. The tests are made to fit different reading skill levels. This one is for the at level or slightly above students.